Come enjoy this beautiful modern one bedroom home along Coal Creek. 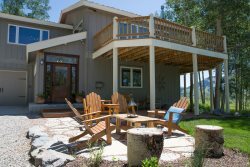 Located on the highly desired west side of town, just a block from Elk Avenue and two blocks to the free shuttle to the Crested Butte Mountain Resort ski area. This property offers true comfort and convenience along with off street parking so you'll never need to move your car. Walk into the home and you step into an open living area complete with a flat screen TV and a cozy couch. It is the perfect place to kick your feet up and scroll through the DIRECT TV listings. Also available on the main floor, a double Murphy bed and a newly renovated full bathroom and kitchen. The kitchen has high end stainless steal appliances and beautiful granite counter tops along with seating for four. Equipped with everything you need to whip up a hardy breakfast before you embark on an adventure. Upstairs you will find the master bedroom with a plush queen bed, vaulted ceilings, and an elegant en-suite full bathroom. There is also a laundry area with full sized washer-dryer hidden behind the sliding doors. This makes Coal Creek the perfect stay for a couple’s getaway.